My 2019 got off to a great start. I flew to Atlanta to attend the Black Lightning second season wrap party and then visited the set for two days. The love and respect I received from literally everyone working on the show was equaled only by my love and respect for them. At the wrap party, I was asked to address the cast and crew. On the set, I sat behind Salim Akil and his monitors while he directed pivotal scenes from the finale. I was given a tour of the amazing sets, the back lot and the construction areas. I had lunch with the wondrous Christine Adams on Monday and with Jordan Calloway, Bill Duke and Marvin Jones on Tuesday. I signed books and posters for members of the crew and even got to wear a Black Lightning vest, as shown in this week’s opening photo. 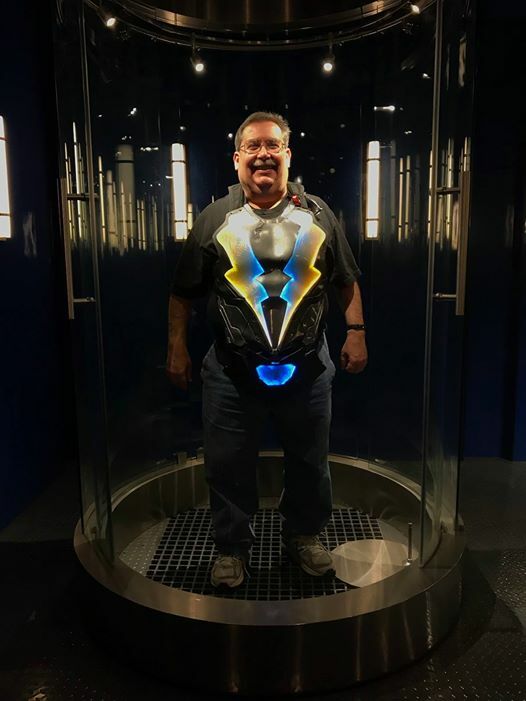 I’ll be writing about my Atlanta adventures over at Tony Isabella’s Bloggy Thing [http://tonyisabella.blogspot.com/]. While I won’t be revealing any details of the remaining episodes airing this season, I will have lots to tell you. 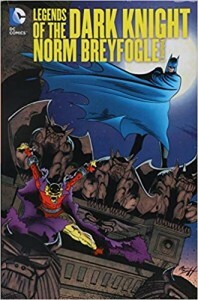 I’ve been revisiting the Norm Breyfogle era of Batman in the sadly out-of-print Legends of The Dark Knight: Norm Breyfogle Volume 1, which was originally published in the summer of 2015. At that time, the 520-page volume sold for $49.99. This days, alas, buying a copy on the secondary market could run you a hundred bucks or more. I’m writing about the volume this week in the hopes my words and your subsequent appeals to DC Comics will convince the publisher to put the book back into print. Breyfogle’s expressive and fluid art is astonishing in its range. He portrayed Batman’s moodiness in both the Dark Knight’s face and figure. He drew dramatic action scenes that fly across the panels in exciting and lifelike manner. He could depict human emotion as well as any of the great Batman artists. His storytelling was solid and, when it served the story, eye-popping. I always like his work and, now that I have the opportunity to study it, like it more with each passing year. It helps that Breyfogle’s art was in the service of great stories by great writers like John Wagner and Alan Grant. Those veterans of the British comics industry brought a different feel to the Batman without losing the essence of the character. Their Batman was the hero of the night streets. No reality-changing epic crossovers in this volume. Just down-to-earth and remarkably entertaining tales of a champion of justice. Guest stories by Mike W. Barr, Max Allan Collins, Jo Duffy and Bob Greenberger add to the mix. Legends of The Dark Knight: Norm Breyfogle Volume 1 is my pick of the week. Keep searching for a copy you can afford. It’s definitely worth the hunt. Dark Shadows: The Complete Newspaper Strips [Hermes Press; $50] is a hardcover collection of the critically-acclaimed but short-lived newspaper strip based on the longer-running afternoon soap opera. Drawn and perhaps written by Ken Bald, the strip ran from March 14, 1971 through March 11, 1972. It was a very good year. Bald has had an amazing career in comic books and comic strips. He drew super-heroes in the 1940s for a number of publishers, notably Timely Comics. He created the character Namora while he was working on Timely’s Sub-Mariner. He drew some of the most beautiful women in comic books, including the Blonde Phantom and Millie the Model. Before Dark Shadows, he drew the Dr. Kildare strip, also based on a popular television series. Starring “good” vampire Barnabas Collins, Dark Shadows went full-on supernatural thriller during its single year. Vengeful immortals and Egyptian gods. Werewolves and a powerful warlock. We even get some time travel with the spirit of a never-born Collins ancestor from the path. The stories could have run a little longer and the writing could have been a little more powerful, but these tales are great fun. Because my schedule was at odds with the afternoon airing of Dark Shadows, I never watched more than a few episodes of the legendary series. This collection of the newspaper strip has me interested in exploring the show’s other incarnations: the TV series, the movies, the comic books and the novels. 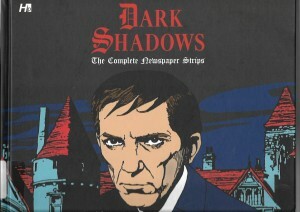 Dark Shadows: The Complete Newspaper Strips is recommended to fans of Ken Bald, newspaper story strips, supernatural fiction and, most certainly, of the Dark Shadows show. InStock Trades, who sponsors this weekly review columns, has it at 25% off. Manga continues to amaze and delight me. My most recent discovery is Satoko and Nada Volume 1 by writer/artist Yupechika with Marie Nishimori as script advisor [Seven Seas; $12.99]. Satoko is a young Japanese woman going to school in the United States. New roommate Nada is a Saudi Arabian woman. Both bring their cultures to their lives in America, a journey played out in single-page comic strips that do have some continuity between the strips. This is a feel-good manga. 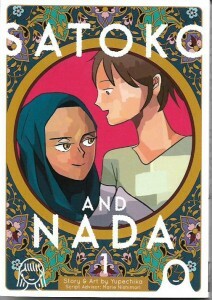 Satoko and Nada are respectful of each other’s culture and eager to learn more about them…and about the culture of our own country. There is a honest and charming humor to their day-to-day lives, building blocks to a beautiful overall tale of acceptance and inclusion. “Friendship knows no borders” is a nice summation of this series. Satoko and Nada possess a good heart, a heart full of hope, a heart full of respect. It’s a charming comic that more American reviewers should be writing about and more American fans should be reading. Suitable for teens and, by my personal estimation, younger readers as well, it gets my recommendation. If you want to start making plans now, my first convention of 2019 will be the North Texas Comic Book Show, February 2-3 at the Irving Convention Center, 500 West Las Colinas Boulevard in Irving, Texas. The guest list includes the “Kraven’s Last Hunt” reunion of writer J.M. DeMatteis, penciler Mike Zeck and inker Bob McLeod plus Larry Hama, Joe Station, Elliot S! Maggin and many more comics greats. I hope to see you there.